16087 - Richard Glaesser Pyramid - Nativity - 7.5H x 6.25"W x 9.5"D"
16087 - Richard Glaesser Pyramid - Starry Nativity - 11H x 9"W x 9"D"
Richard Glaesser Pyramid - Nativity scene with the three wise men and shepherds - Made in Germany - uses #29314W white - #29314N natural - or #29314R red candles. Heat rising from candles turns paddles and base. Traditional table decoration. 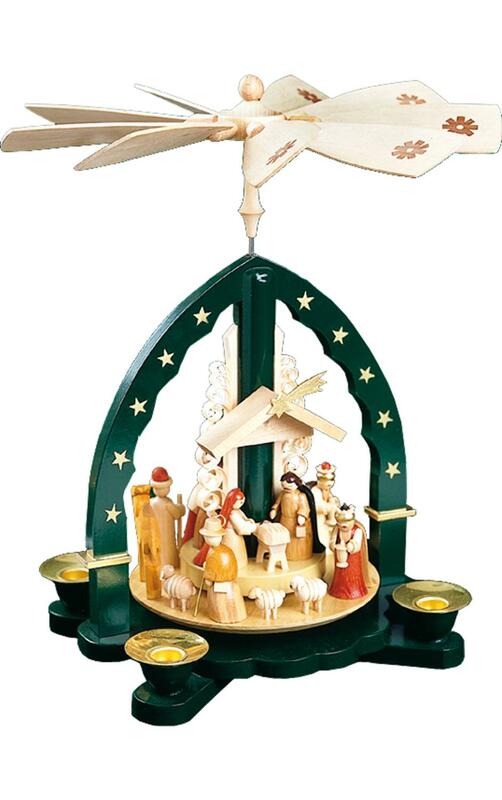 16702 - Richard Glaesser Pyramid - 3 tiers - Nativity - 17.5"H x 11.5"W x 11.5"